The Information Technology industry continues to expand and has a high demand for skilled specialists. 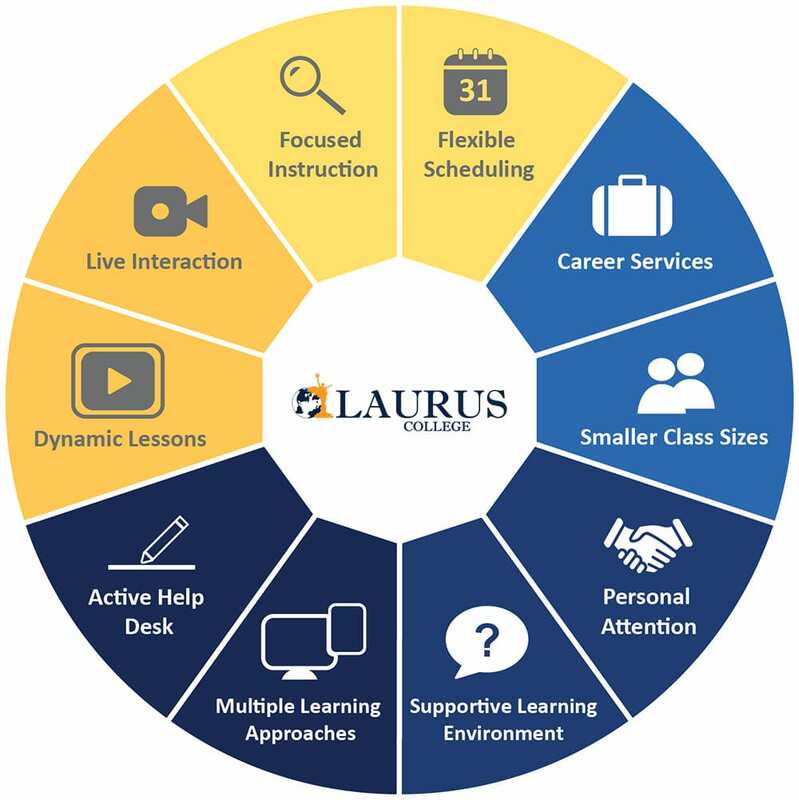 If you’re ready to move up and create a brighter future with a rewarding career, Laurus College has the program to get you there. Our Bachelor of Science Degree program in Information Technologies and Network Systems prepares students to be knowledgeable and well versed in modern technology concepts. The program is designed to help you develop the knowledge to offer technical assistance about computer hardware and software, and learn to perform maintenance to ensure networks operate correctly with minimal interruption. The goal of this Bachelor’s Degree program is to help students develop the technical skills needed for pursuing a successful career as an IT professional. This program covers fundamental and advanced skill development in a variety of IT related areas, while also providing the knowledge to successfully apply information technology theory and principles to address real world business opportunities and challenges. Prepare with Laurus to take the CompTIA A+, Network+, and Security+ exams, to get the industry-leading credentials for IT professionals. Develop the knowledge you’ll need to offer technical assistance with computer hardware and software, and learn to perform maintenance to ensure networks operate correctly with minimal interruption. This program also provides students with the opportunity to effectively use information resources, conduct intellectual research, and communicate scientific knowledge based on today’s technology requirements. Communication: Demonstrate effective oral and written technical communication skills; communicate concisely, professionally, and accurately in various technical professional modes, including an ability to communicate effectively with a range of audiences about technical information. Demonstrate proficiency in communicating technical information in formal reports, documentation, and delivering presentations to users and information technology professionals. Critical Thinking: Demonstrate critical thinking skills using the ability to analyze a problem, and to identify and define the computing requirements appropriate to its solution. Demonstrate the ability to use industry best practices in troubleshooting information technology issues. Information Management: Demonstrate the ability to analyze, plan and support the impact of information and computing technologies overall effectiveness for users, organizations and enterprises on a global scale; effectively map information systems with organizational operational functions across an enterprise. Networking Management: Demonstrate a thorough understanding of how to analyze complex network local area network (LANs), wide area network (WANs), and other critical data communications infrastructure across enterprises; manage, install and oversee safe and secure network data centers by applying modern technologies that will further enhance enterprise security. Expert Knowledge: Demonstrate expertise knowledge of core information technologies that include web, database management, enterprise system security, computer architecture, operating systems, networking and system administration. Application of Standards: Demonstrate competently applying best practices including standards to applications, information technologies, information security, network technologies, and system management. Information Technology Foundation: Demonstrate knowledge of current market trends and innovative information technology in a rapidly changing global environment. Demonstrate the ability to disseminate direct comprehensive knowledge to organizational stakeholders. Information Technologies (IT) & Network Systems professionals provide technical assistance concerning the use of computer hardware and software as well as perform network maintenance to ensure networks operate correctly with minimal interruption. They may also plan, direct, or coordinate activities in such fields as electronic data processing, information systems, systems analysis, and computer programming. The Standard Occupational Classification (SOC) system is used by Federal statistical agencies to classify workers into occupational categories for the purpose of collecting, calculating, or disseminating data. The Information Technologies & Network Systems Bachelor of Science Degree Program offered at Laurus College can help prepare graduates for a variety of careers that include, but are not limited to the list of careers that may be listed under the following SOC codes (for more information on a particular SOC code, visit www.onetonline.org). That means you’re in control of your learning experience. All you have to do is get the ball rolling. 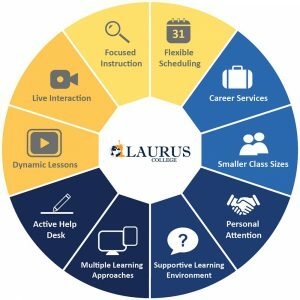 And training with Laurus for a career in IT, with all our dedicated support from Day 1 till you land that dream job, is a smart choice. In this class students will learn advanced security concepts perimeter defenses, network defenses, host defenses, application defenses, data defenses, and assessments and audits. Students also learn how to apply practical mitigation options, and react to attacks quickly. The class teaches students the skills and knowledge needed to harden the network perimeter, secure wireless devices, implement intrusion detection/prevention, and perform backup and recovery. Students will also learn how to protect and maintain integrity of data files, implement security logging and auditing, and run and analyze security reports. In this course, students will learn the difference in Linux kernel, an operating system, and Linux Distributions. Students will start their journey by understanding basic installation of a Linux OS, file system management, users and group management, software installation, user interfaces and desktops, and boot and shutdown of Linux. This course prepares students for Advanced Cross-Platform Skills. It focuses on choosing a strategy, maintaining Cross-Platforms, and maintaining and securing these systems. Students study the fundamental knowledge and skills to configure and manage Internet and Intranet webservers using IIS (Information Services.) This course is intended to help provide prerequisite skills supporting a broad range of Internet web applications, security, and knowledge to help support other products that use IIS. Network Administrators must understand a variety of key networking concepts and technology that include File and Print Services, Group Policy, Networking and DHCP. In this course students come to understand the commonly used features such as disk quotas, permissions, printing services, managing security and group polices, as well as understanding the concept of automatic IP addressing. This course takes a look several areas of advance knowledge of information security within the field of technology. It teaches you skills and knowledge on how to identify threats coming into network system, protect your resources from threats and vulnerability, remedy the results of an attack. Students will also study penetration testing life cycle such as footprinting, enumerating, scanning, system exploits, sniffing traffic, Denial of Service, social engineering and other tactics. Exchange is a popular messaging system that includes a mail server, an e-mail program (e-mail client), and groupware applications. Designed for use in a business setting, the Exchange server are often used in conjunction with Microsoft Outlook to take advantage of Outlook’s collaborative features, such as the ability to share calendars and contact lists. Students will be setting a Servers with Exchange Services running in a Virtual Lab. Students combine acquired skills from previous courses to capitalize in the process of IT and Computer Networking management. Students are introduced to advanced concepts of enterprise communication. They will plan, install, configure, migrate Unified Messaging, manage site resiliency, and manage advanced security in Exchange Infrastructure. Upon completion of this course students will also be able to design, configure and manage e-mails compliance, archiving, discovery, and secure e-mail servers and messaging system utilized in an enterprise. Cloud computing is the development of large-scale disturbed computing paradigm that is the driving force for organizations to grow to scale without the need for large dependent information technologies infrastructure. This course delivers a comprehensive in-depth study of Cloud Computing Solutions, Concepts and capabilities. This course covers cloud computing services, technologies, and the implementations on today’s global enterprises. Students combine acquired skills from previous courses to capitalize in the process of IT and Computer Networking management. They learn advanced topics in computer and network services such as high availability, certificate management and digital rights management. Upon completing this course, students will be able to implement network load balancing, failover cluster, managing certificates and active directory rights management services, with the goal of keeping high network uptime.